Located at Fort Baker in beautiful Sausalito, the Bay Area Discovery Museum offers vibrant hands-on exhibits for children in an excellent setting. In addition to workshops, events and festivals, the museum hosts permanent and changing experiential exhibits. Fort Baker, 557 McReynolds Road, Sausalito, 487-4398, www.badm.org. Go eye to eye with moray eels and bobbing penguins in the “Splash Zone,” an entertaining hands-on family gallery where kids can also witness playful sea otters, turtles, sharks and other mysterious deep sea animals amid the backdrop of a towering kelp forest. This is truly one of the finest aquariums in the world. 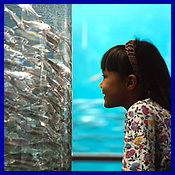 886 Cannery Row, Monterey, (831) 648-4888, www.montereybayaquarium.org. Parents can enjoy a peaceful, uninterrupted and elegant gourmet dinner in a separate railcar, while a professional daycare provider entertains their children (ages 3-12) with games, movies and a meal aboard their very own car for free. This three hour trip begins in beautiful Napa, steams over to St. Helena and back again, covering 36 miles in total. Call for a list of scheduled tour dates, reservations required. 1275 McKinstry Street, Napa, (800) 427-4124 or (707) 253-2111, www.winetrain.com. An Oakland A's baseball game is a great way to spend the day with the kids. Tickets are usually available, but call ahead to confirm. 7000 Coliseum Way, Oakland, (510) 568-5600, www.athletics.mlb.com. The Oakland Raiders have a legion of fiercely devoted fans, adding to the fun of game time. Always exciting, these football games keep fans stirred up and entertained. Tickets are usually available, but call ahead to confirm. 7000 Coliseum Way, Oakland, (888) 44-RAIDERS, www.raiders.com or for tickets go to www.tickets.com. Great America doesn't hold back when it comes to thrills and fun. Popular children's characters entrance youngsters and everyone will appreciate the 70+ modern rides, shows and events showcased during the park's 25th anniversary. Season opened March 24th. 4699 Great America Parkway, Santa Clara, (408) 988-1776, www.pgathrills.com. Saturday Morning Adventure Sails onboard the Sausalito based tall ship Hawaiian Chieftain are exciting for the whole family. For four hours, passengers are encouraged to pitch in and help sail the ship under crew supervision, taking a break of course, for a leisurely buffet lunch. The Hawaiian Chieftain also offers a variety of day tours and summer camps, contact them for a complete schedule. 3020 Bridgeway, Suite 266, Sausalito, (800) 200-LADY or 331-3214, www.hawaiianchieftain.com. Six Flags is America's only combination wildlife park, oceanarium and theme park. If the family is ready for a close encounter with some wildlife tempered by roller coasters and thrill rides this is the place to be. For a break from the whirlwind of fun, take in the stunt show or the Looney Toons rock'n roll musical revue. 2001 Marine World Parkway, Vallejo, (707) 643-6722, www.sixflags.com.